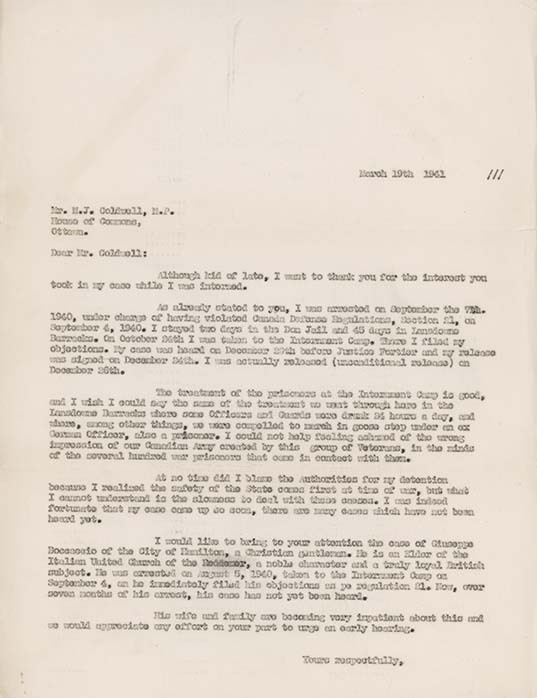 Letter from Libero Sauro, to M.J. Coldwell M.P., March 19, 1941. After his release, Sauro continued to help other internees and their families. As shown in this letter, he is advocating on behalf on internee Giuseppe Boccaccio. M.J. Coldwell, an M.P. from the Co-operative Commonwealth Federation of Canada Party (CCF), had provided assistance in Sauro's own case, when contacted by Clementina, Sauro's wife. Internees were not charged with a crime and so not entitled to habeas corpus. However, under the the DOCR (Defence of Canada Regulations), after 30 days, internees could formally object to their detention to an advisory committee appointed by the Minister of Justice. The Minister of Justice then appointed a judge to review the internee’s case. This meant an examination of the RCMP’s evidence against the internee, meetings with the internee, and interviews with witnesses who could attest to the internee’s character. After this, the judge either recommended an internee’s release or continued internment to the Minister of Justice. Unfortunately, this process seemed beset with delays and some confusion in many examples. As a result, Sauro who was released unconditionally did so after 111 days of internment. Boccaccio would serve 598 days of internment.